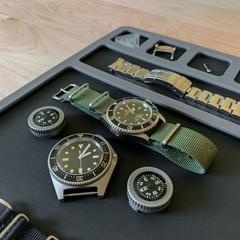 The PDW Benchtop Work Mat is a uniquely designed, dedicated work surface for working on popular EDC items and tools like flashlights, pocket knives, watches and more. 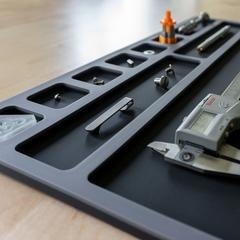 Perfectly suited from the workshop to kitchen table, the Benchtop Work Mat addresses a long overlooked need for Makers, DIYers, Craftsmen, Tinkerers and EDCers who routinely assemble, disassemble, maintain, or service tools, and other objects. 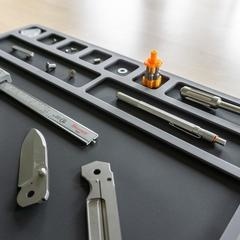 While initially intended as a dedicated work mat for working on folding knives, the crossover applications to other objects became immediately obvious. 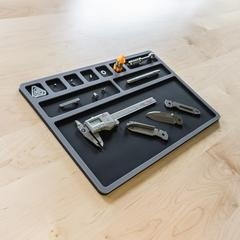 The smallest negative relief individual organizer pockets molded into the PDW Benchtop Work Mat keeps anything from small machine screws, washers, spring bars, to selector detents and springs from rolling off your tabletop and into the dreaded abyss of the workshop or kitchen floor. 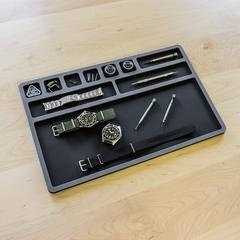 The mid-size comparts are to stage folder handles, slides, watch straps, pocket clips, to recoil springs and barrels. The single large compartment is your main work and assembly-disassembly area. 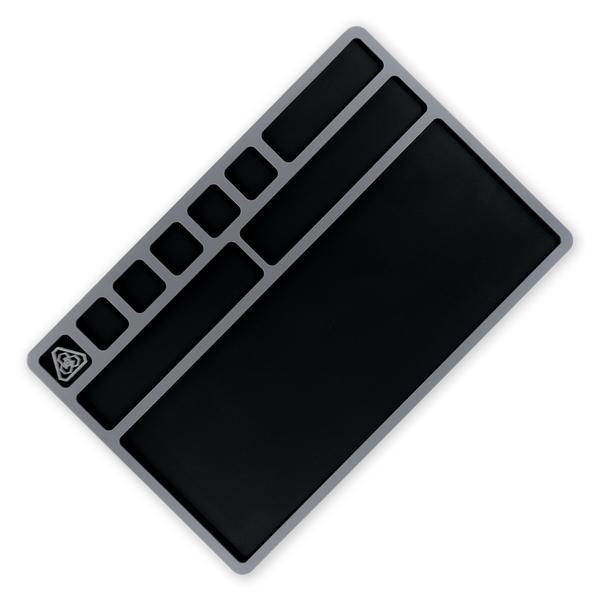 The updated black color resists oil and grease stains while working on your project. Even the glow-in-dark PDW 3D logo was designed to hold and stage tiny bits like diamond points from a flexible rotary shaft grinder to micro driver tips. The 11" x 17" footprint will tackle most of your small to mid-sized benchtop projects. These Benchtop Work Mats will help reduce clutter, keep your project contained and organized. 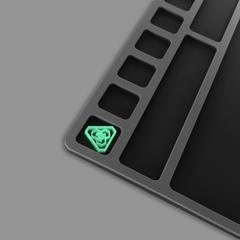 You're going to want at least 2, one for the workshop and one for the house. Hand Wash Hot-Warm Water with Dish Soap, Dry Flat on Rack or Towel.